Paella, a specialty of Spain’s Valencia region, takes its name from the shallow, two-handled pan in which the dish is usually cooked and served, but you can easily prepare the perfect paella using a large, shallow sauté pan from your cookware collection. Using Hoffy Smoked Sausage adds a smoky, wonderful flavor resulting in a simple preparation, perfect for feeding a crowd, to celebrate Father’s Day, graduations or anytime! In a paella pan or a very large sauté pan, heat 2 tablespoons of the olive oil over medium heat. Add the sliced Hoffy Smoked Sausage and smoked paprika and sauté until browned on both sides. Add the onions and bell pepper and sauté 3 minutes. Add the garlic, red pepper flakes and rice and sauté for 3 minutes more, stirring constantly. Add the saffron threads, bay leaf, salt and pepper and broth and bring the liquid to a boil. Cover the pan with the lid or aluminum foil and reduce the heat to a simmer. 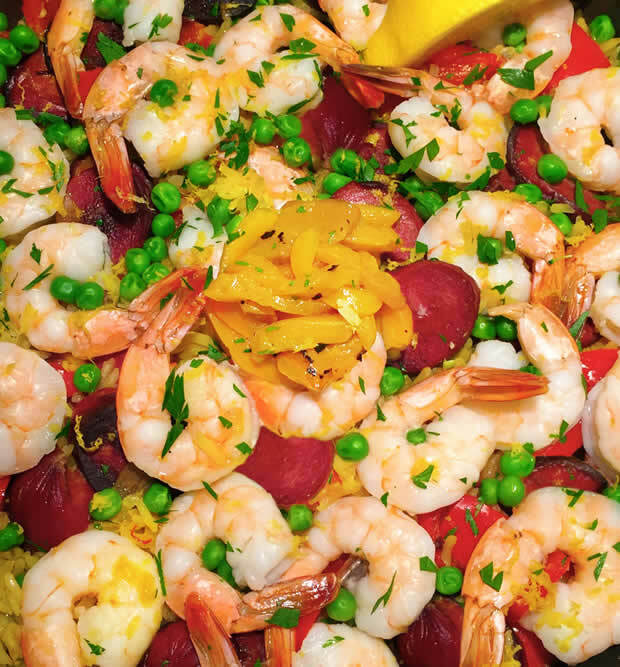 After the rice has cooked for 15 minutes, add the shrimp to the pan, scattering them in an even layer on the top of the rice, along with the peas, and scatter the lemon zest over the paella. Cover the pan again and cook for 8 to 10 minutes longer. To serve, garnish the paella with the roasted peppers and parsley. Serve with wedges of lemon and warm bread.